At Memora Health, we’re building a distributed network for health delivery. We have a health system where the highest-risk & most expensive patients are treated reactively, not proactively. We believe the fundamental payment model for healthcare delivery is broken. We’re stuck paying for the most expensive parts of healthcare, chronic illnesses and behaviorally dependent conditions, with a fee-for-service business model. Our vision is to unbundle care management for patients, providing long-term services such as health education, disease management, and medication reminders directly to patients at home, so that each patient receives the care and support they deserve, all at a lower cost to the system at large. Furthermore, we hope to develop a two-way system, constantly monitoring our patients and their preferences, both to distribute accurate health information to care managers and tailor our platform to each individual’s unique need. SMS offers a low-cost, high-impact tool to achieve this solution. SMS messaging has shown a significant positive impact on fostering desired behavior change among patients. 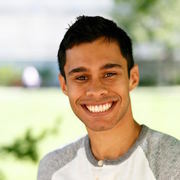 A 2016 meta-analysis of academic studies pooling over 2700 patients showed that SMS reminders nearly doubled both short- and long-term medication adherence and patient motivation in various acute and chronic diseases2, including Type II Diabetes , cardiovascular disease , HIV , and schizophrenia , across the socioeconomic spectrum. 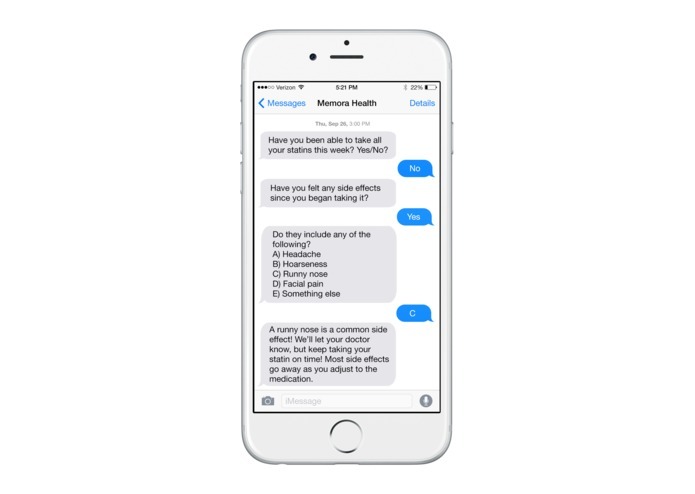 Additionally, SMS reminders significantly improved patient satisfaction, with 93 to 100% of patients finding messages ‘very helpful’ in regards to improving their adherence2, 90% claiming they would like to continue receiving messages2, and 92% mentioning that they would recommend SMS-based interventions to family and friends. Including health literacy advice in conjunction with medication reminders further improved adherence, patient satisfaction, and the perception of feeling ‘cared for’ outside the hospital. Lack of education around basic health information leads to approximately $106 billion to $238 billion in economic burden each year. SMS-based health education outreach serves as a low-cost tool to address a crippling health economics challenge. The passage of the Affordable Care Act and the transition to Accountable Care Organizations and value-based reimbursements incentivizes hospitals to reduce readmissions and cost overruns. The Readmissions Reduction Program places a penalty on hospitals that have excess readmission rates within 30 days as an indicator of poor quality care. Penalties range from 1 to 3 percent of all Medicare DRG-related revenue. Under the 2015 guidelines, 75% of hospitals will face some amount of readmission penalties. Similarly, there are incentives for individual doctors under the Medicare Physician Feedback/Value-Based Payment Modifier Program, which rewards or penalizes physicians based on quality and cost metrics. The program is specific to Medicare Fee-for-Service and began affecting practices with 100 or more providers in 2015. There is a lot of incentive for participation—physicians can receive as much as 100% payment increase for high quality scores in low-cost services and be penalized up to 1% for a low-quality, high cost item or service. As a result, hospitals and physicians are searching for ways to keep patients happy and healthy at home, which is where Memora Health excels. We market to Accountable Care Organizations, including major academic hospitals, which pay via a subscription model, similar to electronic health record companies. New reimbursement codes for remote chronic care management means that providers who ‘prescribe’ our software to patients can be reimbursed by Medicaid. Providers already spend time caring for their patients, we make their time count. The service is free to use for patients and accessible on any cellular phone. 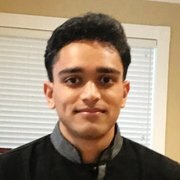 A meta-analysis of three-month-long trials of previous SMS interventions indicates that over 90% of patients found the texts helpful and wanted to continue receiving them2, dispelling the myth of alert fatigue and validating the use of our platform for both short and long-term care management. Communities traditionally underserved in healthcare can be most effectively reached via mobile technology. In 2013, mobile phone penetration had been estimated at 86% among American households earning less than $30,000 per year, 93% of which regularly send text messages . In the same demographic, only 59% have access to a desktop or laptop, while just 47% have broadband at home. Specifically, SMS text messaging is a low-cost way to facilitate engagement with individuals living with chronic conditions and other health challenges. We’re building digital therapeutics to reach the last mile of healthcare delivery, and the patients that need it the most. 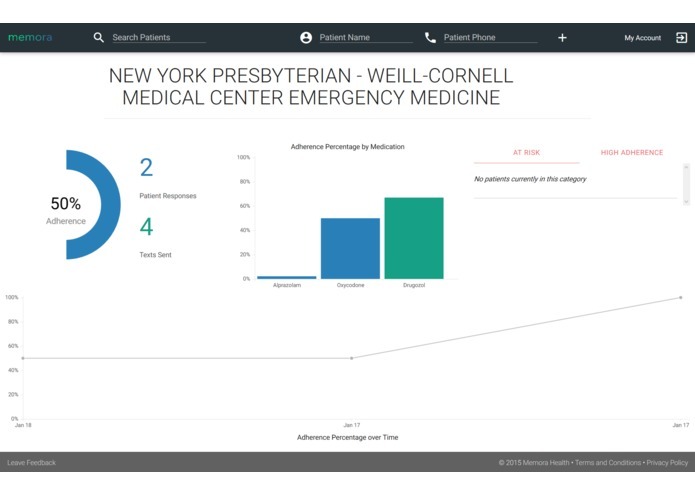 We are currently running a pilot trial with the New York–Presbyterian Hospital/Columbia University Medical Center Emergency Department measuring both patient adherence and satisfaction and provider ease-of-use of the platform. 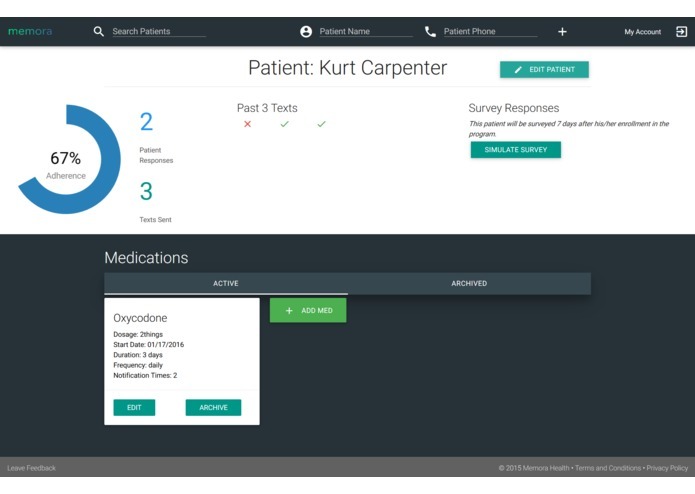 Our metrics for the pilot were chosen to illustrate clinical results supporting improved health outcomes as a result of using this technology and an immediate financial return-on-investment for providers and healthcare organizations, both from optimizing a healthcare professional’s time and resources and from higher patient satisfaction. Our strategy is to first target clinics at hospitals focused on specialized care where single-medication adherence is critical to short-term patient health, such as anticoagulants following interventional cardiology procedures, antipsychotics and antidepressants for psychiatric patients, and antibiotics for postoperative and emergency room patients. These clinics receive the highest value per-use case of our platform regarding medication adherence and preventing short-term emergencies. Following buy-in from these specialty clinics and departments, we plan to spread to outpatient clinics and departments within those hospitals and healthcare organizations managing patients with chronic disease, where our value proposition is based on reimbursing providers for remote chronic care management and streamlined care management for outpatients. We are specifically pursuing a broad range of pilot markets, including emergency medicine, psychiatry, cardiology, and surgery to gather useful data across patients and healthcare departments for high-value use cases. Our patient guidelines and waivers are grounded in specific advice from the Partners HealthCare Center for Connected Health, which has an incredible deal of experience with on-boarding patients and clinical trials. In the long-term, given the prevalence of SMS in developing countries for financial transfers and seven billion mobile phone subscribers worldwide, we believe it would be the best medium for remote chronic care management delivery. By acting as a first-mover in countries such as India and Kenya, Memora Health could serve as a their first light-weight, cloud-based electronic health record with an API that digital health companies in those countries could latch on to. In addition to our ongoing pilot at Columbia University Medical Center, we’re currently awaiting IRB approval for a second emergency department pilot at Weill Cornell Medical Center and are designing pilot studies with the Brigham & Women’s Hospital Department of Psychiatry, Emory University Surgery, Emory University Cardiology, and Grady Hospital cardiology. Memora Health has won the Brigham & Women’s Shark Tank, the 2015 Harvard Business School SPARK Entrepreneurship Conference pitch competition, and was a finalist in the Google Wearables in Health Pilot Challenge. Memora Health is currently in-residence in the Harvard Innovation Lab Venture Incubation Program and the Forge Health Founders Forum.